The shifting of UK financial services jobs to developing countries such as India and China has saved the sector about £1.5bn a year, a study suggests. 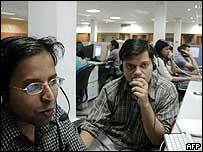 Accountants Deloitte said the number of financial jobs going overseas over the past four years had increased 18-fold. 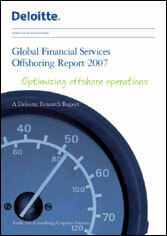 More than 75% of major financial institutions have operations overseas, compared with fewer than 10% in 2001. Chris Gentle, associated partner for financial services at Deloitte and author of the study, said: "Financial institutions need to re-engineer business processes, or risk simply transferring offshore the legacy inefficiencies of older, onshore processes." The offshoring industry is growing up quickly. Most major financial institutions now operate a sizeable, low-cost offshore delivery function. The industry’s cumulative cost savings for the last four years have risen sharply, propelled by an 18-fold increase in offshore headcount. Over 2006, average total headcount offshore doubled to six percent of total group staff. More than half of all financial institutions surveyed are now saving more than 40 percent for each business process offshored. In future, the best offshoring strategies cannot be based solely on financial gains from labor arbitrage. Otherwise the legacy inefficiencies of older, onshore processes may simply be transferred offshore. ...Enter Phase II: The DTT GFSI group’s analysis has identified three phases to an offshoring journey for financial services institutions: Build, Optimize and Release. Organizations can realize the full value from their offshore operations only when all three phases are complete. As financial institutions enter the second offshoring phase, their efforts are on streamlining migrated business processes. The impact of this application on best practices is becoming evident across all financial services. A select group of financial institutions – offshoring’s stars – has successfully deployed aggressive offshoring strategies, resulting in the transfer of more than five percent of group headcount offshore and achieving bottom line savings in excess of 40 percent. In some instances these savings have been equivalent to three percent of their total cost base. Other institutions, that have failed to apply the best practices have, in some instances, experienced a decline in their operational performance. This has put their prospects of realizing full future value from their offshoring operations at risk. Deloitte's are clearly using this report to tout for business. But the trends they point to are no less real for that. Six per cent of staff may not sound that much, but if it has doubled in just four years it could easily double again. It is nice to know that sourcing decisions should not be based only on cost arbitrage grounds,because it'll help to focus on the quality.I too expecting good grow phase in KPO and EPO in the near future.. I've used brokers who have "outsourced" client assistance. They are even worse than the kind that don't. I wont be going back. In fact, I've pretty much given up on being a "market participant". I am keen to let it all ride in Index Funds and let the Good Lord sort out the rest. My only concern is a major turn down in the market, for which one must remain at least aware of general trends. But, "beating the market" is simply not worth the effort required and leads only to useless account churning. Also, there is the question "beat which market". Europe has been on a roll and Index Funds show handsome profits across the board. One is inclined to believe that the oommph has got to end sometime with European European equity markets. But, diversifying into Far East funds? Well such investments are not for the faint of heart given the frenzy seen there. Also, this week's article in the The Economist about how brokers no longer can afford "buy side" research is telling. Well worth the read, if you want to understand why they are off-shoring much of their client interface. If one does not have more than a million dollars to invest, then they are just "Joe Average" to most brokerage firms in America and Europe. I guess there’s not much to be surprised here: Financial service firms know the bottomline of business decisions, and the need to add value to the topline: Many are realizing how Offshoring IT Services provides the benefits; right? Mohan: Many are realizing how Offshoring IT Services provides the benefits; right? Yes, we realize. The question remains, nonetheless, "for who?" Offshoring and outsourcing services are some of the fastest growing industry not only in India and China but also in the Philippines. More countries are now entering this kind of business. Thanks for the info. More countries are now entering this kind of business. Thanks for the info. I really appreciate this blog thanks for sharing this information with us.